Any item which has had grip soles or additional heels fitted may not be returned as this is deemed to be customisation of goods. 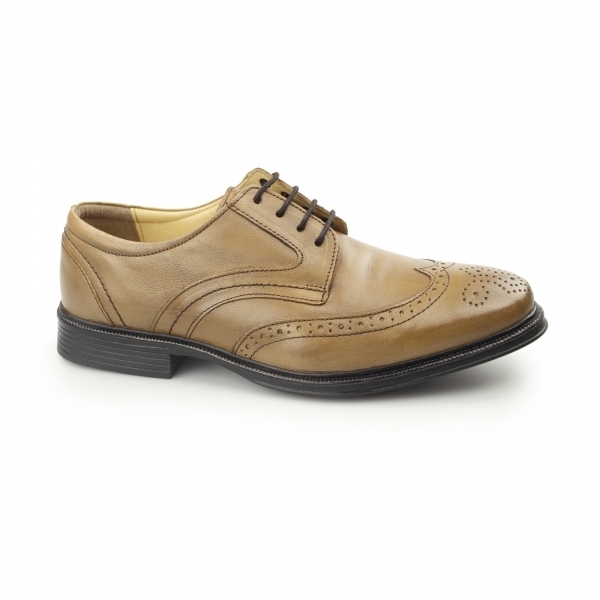 Shuperb present to you a classic pair of lace up shoes by Cotswold that are sure to become your favourite pair. Made with a quality leather upper and lining, your feet will breathe easily in these durable shoes. The supple PU sole will comfortably flex with your feet as you walk while the four eyelet lace-up will keep them secure. A traditional Derby design with a retro wingtip brogue pattern, they're smart enough to take you from the office to a night out. Delivery to UK customers is FREE. Target delivery time: within 3 working days. There is no minimum order amount to get free delivery. Express delivery options on checkout. We use DHL exclusively for international postage. This ensures you receive the fastest and most secure transit of your goods. In most countries, this is usually a door to door service. We offer a standard 30 days returns policy to all our customers. Full details of our returns policy can be found on our Delivery & Returns section. Your privacy and security is our priority. We are pleased to inform you we use the latest secure technology to ensure your details are never compromised. Your connection to Shuperb is encrypted on all our pages, 100% of the time. Encryption makes it virtually impossible for unauthorised people to view information travelling between computers. Our site is certified by GeoTrust Inc, a leading provider of SSL technology. If you have any questions regarding this, please do not hesitate to get in touch.